For dimming, a 5-wire connecting cable is required. Dimming requires a 5-pole connecting cable. The Nemo Kepler pendant light LED seems like a light painting. The pedant light’s curved aluminium profile stretches in three dimensions, creating extraordinary shapes that magically attract everyone’s attention. In doing so, the pendant light alludes to the famous German astronomer Johannes Kepler who discovered the laws of planetary motion. 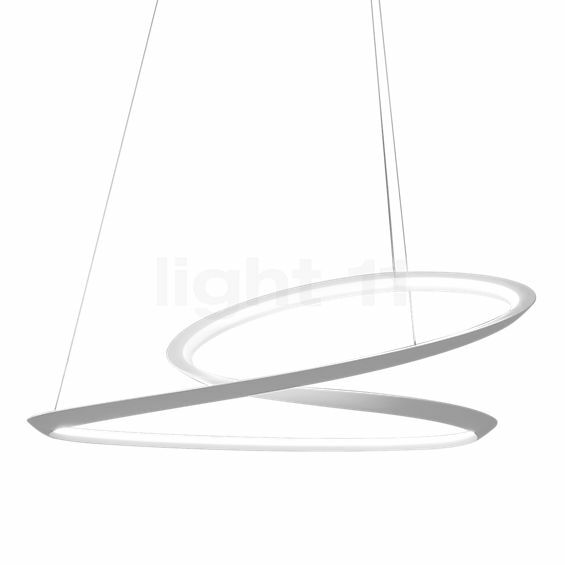 Indeed, the curves of the Kepler LED pendant resemble the planetary orbits around the sun. However, the source of light here is an integrated LED strip, which is covered with a high-quality frosted acrylic diffuser. Arihiro Miyake designed the Kepler by Nemo. Depending on the selected version, the Kepler LED by the Italian manufacturer Nemo emits its light either directly downwards or upwards. The latter creates a particularly harmonious and pleasant ambient lighting. In order to adjust the brightness to your personal preferences, the Kepler LED can be connected to an external 1-10V dimmer. What is more, the pendant light by Nemo produces a remarkable luminous flux at a low energy consumption. Tell other customers and us about your experiences with the Kepler Pendant light LED ! The Nemo Kepler LED is suitable for many different areas. The downlight version, for instance, can be used to provide a dining table with extensive light. In this way, food and drinks on the table are accentuated in an appetising way. Instead, the uplight version of the Kepler LED is recommended for providing foyers and entrance areas with ambient light. Furthermore, the pendant light by Nemo also really comes into its own in the living room. There, both upwards-directed light and light focused downwards provide for a pleasant lighting atmosphere.